Le décor est magnifique ! Picturit: Indeed so, Martine. And fun to do I think. Oh! Wow! yes, beware of the current! Picturit: Indeed, those are the hidden dangers everywhere. We walked the bridge on another day. That's a treacherous spot isn't it?! I love the tones in your photo - the bridge looks so wonderful! How fun that you found a video for this, Astrid! It was clear from what we saw that they were being given lots of instruction. Picturit: I had to look hard for that video, Ginnie. There was nothing in English and as you know my Italian is a little 'watery'....It was fun to see them rafting in this setting of that wonderful old bridge. That current looks very strong Astrid! Picturit: It was and I think when more water is in the river, it is dangerous, people miss-judge the current of water. What a grandious bridge! - have you been on it? I see a person standing there. Picturit: We crossed it twice and it is pedestrians only. An amazing architecture. And beware of the sultanas Astrid. Such an Italianate bridge, but then, no surprabout that. I did t know it was so hard to keep a raft upright. The bridge is a piece of art indeed. Picturit: Thank you. Lisl. I never expected to see any 'boats' on that river..
That bridge is a piece of art indeed. What a swift current the video shows! What a fabulous bridge! Picturit: That bridge was mind blowing to us, so old and still standing. Picturit: Don't you love those videos I always try to find something about the things we visit. That bridge is mind blowing....1354..... and still standing. We found this bridge quite impressive during our visit, I seem to reacll we sat along the river bank nearby and rested our weary legs and feet! 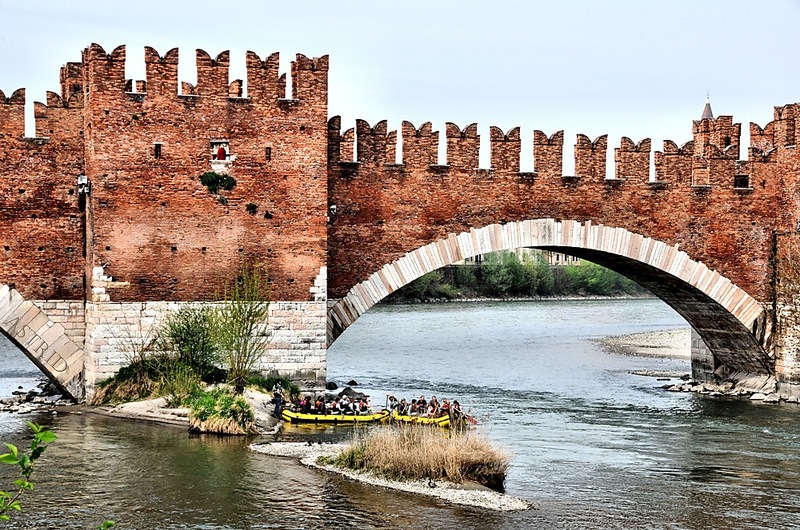 Picturit: I am so happy for you and Maureen that you have fond memories of this bridge and your time in Verona. We were tempted to sit down, but we choose to have lunch inside, the sun and Ginnie's skin are no friends of each other. Picturit: Thank you, Peter. They sure will have fun. Verona is full of these amazing architectures. We had a wonderful time there. Picturit: We walked the bridge and you can really hide behind them and shoot the enemy. This is a fabulous bridge. this is a great shot of the bridge, Astrid. i am trying to picture this place when it was built. Picturit: In 1354... that to me is mind blowing. The bridge is well maintained and still standing.